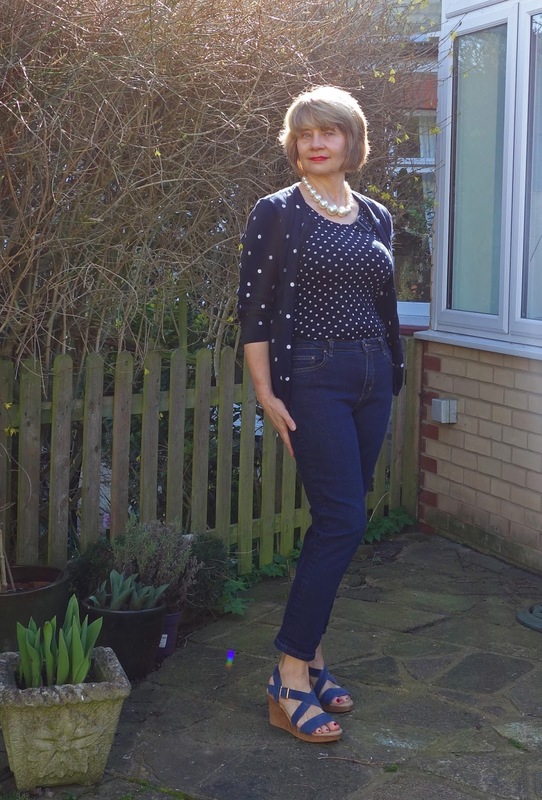 Polka Dots, Pearls and Navy | Is This Mutton? I've had the polka dot top for several years (and also in black, because if you find a great top, buy it more than once). I saw the polka dot cardigan online at Peter Hahn. It's a bit longer than I like in a cardi. I prefer them cropped, otherwise they can look a bit mumsy. 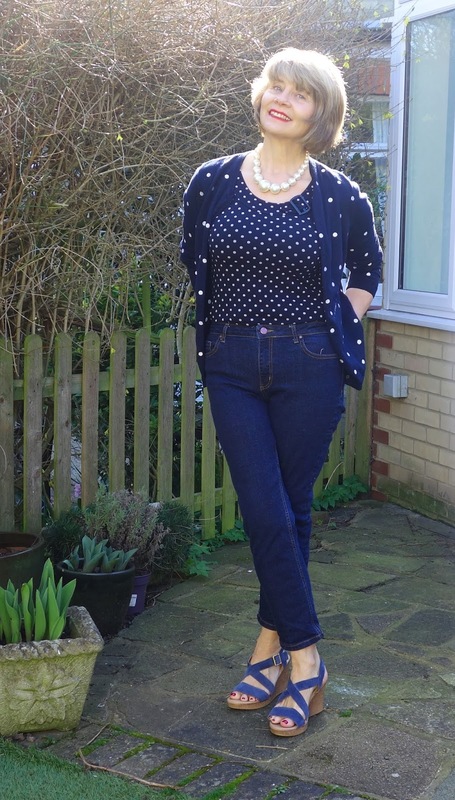 Jeans: Cambridge cropped jeans from Boden; denim wedges, Marks & Spencer, past season. Top: Country Casuals, past season. Cardi: Peter Hahn. I had a few lighting challenges taking these pictures - it was the one day last week when we had a heatwave! Tuesday 21 March: It's National Fragrance Day and we celebrate with the memories of five women in their 40s, 50s and 80s. Thursday 23 March: A spectacular find in a charity shop - a Dolce & Gabbana jacket. You could work a red patent leather belt with those jeans too! You look very nice and well put together. I was intending to wear a red belt....but I'm not very enamoured with the one I've got! But deffo, will try it. 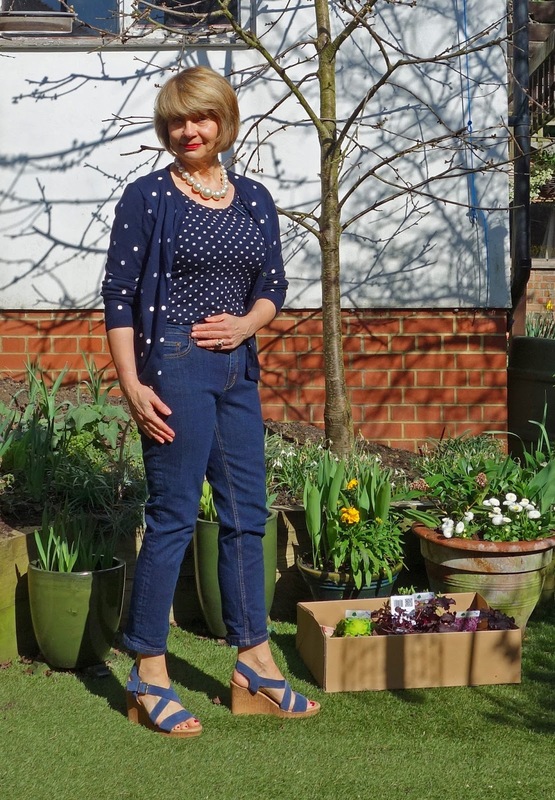 I love this idea of wearing our pearls with anything, Gail! I've been trying very hard to remember to wear mine! In fact, I just submitted an article on Sixy + Me (to be published soon) about wearing our pearl jewelry---that's so funny you wore yours now!! I love Pearls. large or small, they will never date. 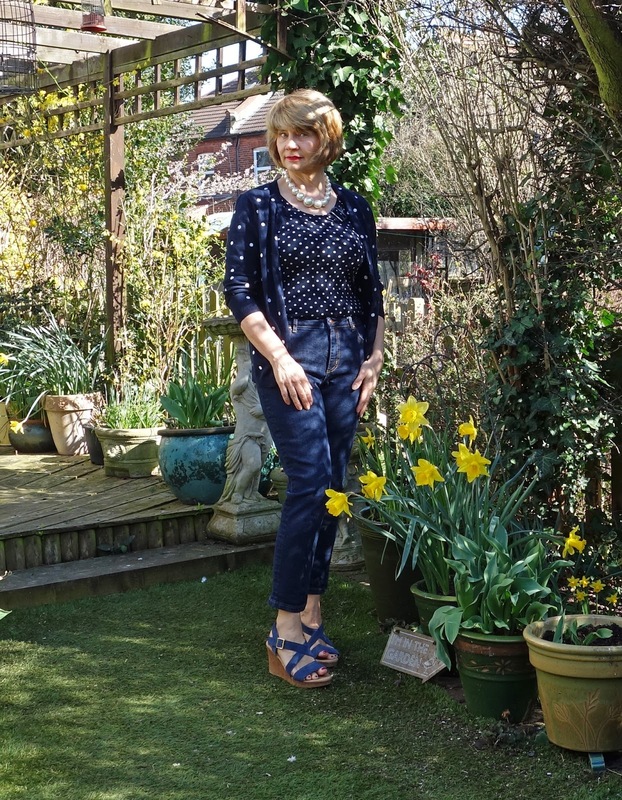 Lovely photos Gail (I'm admiring your garden too) And those jeans look a good cut and fit lovely. Thanks Laurie....exciting times in the garden now that spring is arriving! But lots of big jobs to do (replacing decking, painting the garage, painting the furniture....). A very lovely and interesting look! The top's and cardigan's polka dots match so nicely. This is a great casual outfit Gail. I'm with you on how the wrong length of cardi can be a mumsy - I prefer cropped ones too. And yes, the pearls work with everything don't they? Having lighting issues because of the sun is such a rare event at this time of year, it really can catch us out eh? I've got a bleached out photo shoot from recently that I'm sitting on currently in the hope that something better will come along soon. I really love your "double dose" of polkadots here. Send some of your heat my way! Perfect. Navy and pearls and polka dots are so elegant together.